So I was playing around in the kitchen with some of my favorite ingredients: cheese, bacon, dates, cayenne pepper, and oh yeah…dark chocolate. I came up with this outrageous treat. 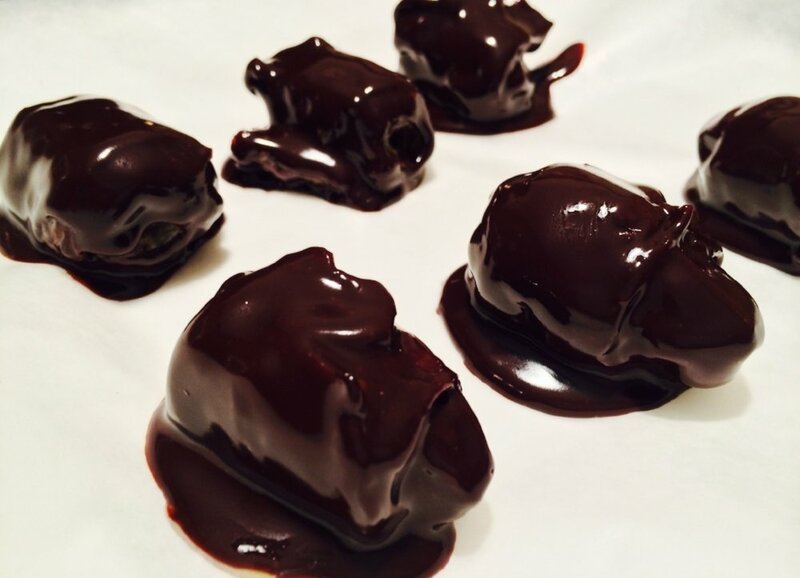 These puppies aren’t your healthiest Super Bowl treat, but they certainly (at least) qualify for a Paleo Diet yummy. These goodies are easy to make in bulk and are a great treat to set out for your guests this Super Bowl Sunday! ‍Preheat your oven to 400° F.
Microwave your bacon for two and a half minutes, just so that it gets crispier when you cook it later on. Let it cool a bit and cut each slice in half, width-wise. Stuff some cheese into each date and then wrap in bacon, securing with a toothpick so the bacon does not unravel. ‍Bake in a sided cookie sheet in oven for 15 minutes. (You may find it easier to clean up if you line your cookie sheet with parchment paper). While the dates cook, simmer heavy cream in a small saucepan. Add in the chocolate and let melt while continuously stirring. The melting process shouldn’t take super long so you may want to time it to coincide with the last five minutes of the dates’ baking. Make sure to melt away any lumps. You want silky chocolate. Add in a tiny sprinkle of cayenne (to taste) for a nice zing of spice. Let the bacon-wrapped dates cool just a bit along with the chocolate. Then dip the dates in the chocolate, being sure to coat entirely and set aside on a plate.